Bao Zheng ( 11 April 999 – 20 May 1062), commonly known as Bao Gong (“Lord Bao”), was a government officer during the reign of Emperor Renzong in ancient China’s Song Dynasty. During his twenty five years in civil service, Bao consistently demonstrated extreme honesty and uprightness, with actions such as sentencing his own uncle, impeaching an uncle of Emperor Renzong’s favourite concubine and punishing powerful families. His appointment from 1057 to 1058 as the prefect of Song’s capital Kaifeng, where he initiated a number of changes to better hear the grievances of the people, made him a legendary figure. 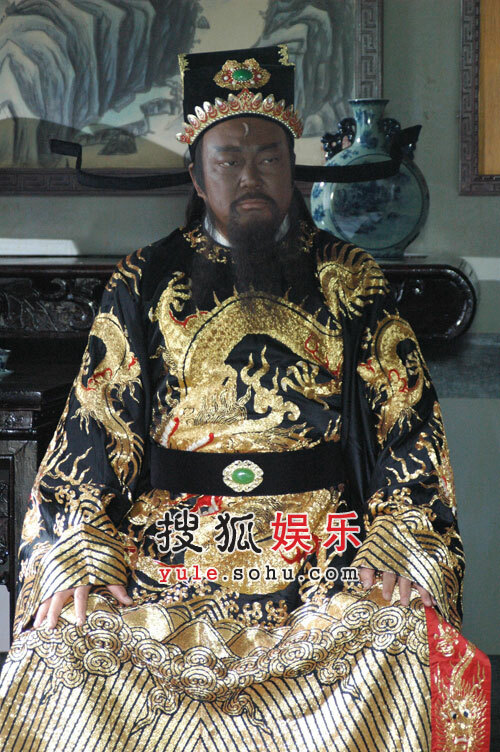 Nicknamed “Justice Bao”, Bao Zheng today is respected as the cultural symbol of justice in Greater China. His largely fictionalized gong’an and wuxia stories have appeared in a variety of different literary and dramatic mediums, and have enjoyed sustained popularity. In opera or drama, he is often portrayed with a black face and a white crescent shaped birthmark on his forehead. In legends, he is described as a dark-skinned Chinese man with a very dark face. Ha ha. Funny. The director of that play was not very thorough. maybe the fingers are in the sun and face is shaded?